For the Agile 2010 Conference, I had submitted a panel session on the topic of Agile and the Federal Government. Fortunately, my session was picked up by the conference. Thus, tomorrow (Thursday 8/12) at 3:30PM, we will be presenting "Agile and the Federal Government - A Panel Discussion". This session promises to be interesting and will be in a format similar to last year's "Agile and the Federal Government - A Panel Discussion" at APLN DC. 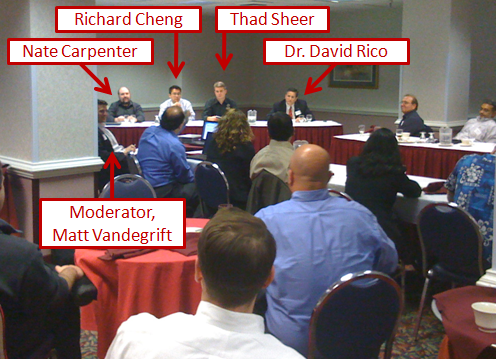 For anyone that has the printed Agile 2010 Conference program, it has the people above listed as the panelists. I expected to lose one or two people to unforseen circumstances and thus we had also recruited Rodney Bodamer (AgileX Consulting, APLN DC chairperson) as another panelist. The unfortunate news is that due to work conflicts, David, Suzette, and Jesse are unable to attend the conference. The great news is that we found great new panel members to take their place. Suzette recommended Andy Pickler. Andy works with Suzette in leading the Agile Community of Practice at Northrop Grumman. On seperate recommendations from Ken Mills of VersionOne (thanks Ken) and from David Rico, we welcome Dottie Acton to our panel. Dottie is Senior Fellow at Lockheed Martin and has deep experience in Agile and in the Federal sector. The Agile Manifesto states interactions over processes, collaboration over contracts, working software over documentation, and responding to change over following a plan. These base principals seem to be diametrically opposed to the Federal government. Is Agile appropriate for the Federal government and is the government ready for Agile? This panel discussion will look to address this question while taking a deep dive into the value, issues, details, and vision for Agile in the Federal government. The session will be a facilitated 90 minute panel discussion featuring panelists who are not only Agilists, but also deep in expertise and experience in the Federal government space. Each question will start with a panelist or two presenting their thoughts followed by an opportunity for other panelists and attendees to provide their input and ask questions. We will encourage active participation by the audience with a goal of having a lively and interactive conversation. Dottie Acton is currently a Lockheed Martin Senior Fellow, and has served as the chief software engineer and as a process/methodology consultant for several major programs. Over her 30 year career, she has worked the entire program life cycle, from proposal through operations at the customer site. Dottie has a BA in Mathematics from Lycoming College, and an MS in Computer Science from Syracuse University. She is an avid reader, and is always studying new technologies. Dottie's major area of interest is software development methodologies and techniques. She enjoys teaching, mentoring, and figuring out better ways to develop software and is currently helping programs apply Agile development methodologies. In addition to her knowledge of a wide range of software methodologies, Dottie has expertise with C++, Java and COTS integration. She has also led teams in developing effective metrics programs and preparing for CMMI assessments. Rodney provides leadership in helping enterprise level clients adopt the use of both lean and agile methods, techniques, and best practices. Rodney has led numerous agile product development teams as a Certified ScrumMaster and Product Owner and has successfully coached numerous Fortune 100 clients in their transition to Agile. Rodney has trained and coached executive management on approaches and solutions to lean-agile institutionalization and organizational change management adoption challenges. He has over 15 years of project, program, and release management experience leading large, complex, mission-critical IT projects in the financial services, government/defense, insurance, and healthcare industries. Rodney is an Agile Program Manager at Agilex Technologies. He is the chair of the Agile Project Leadership Network (APLN) DC Chapter and is currently working to bring Agile to the Department of Veteran Affairs. Richard Cheng is a managing consultant at Excella Consulting, providing consulting services to commercial and Federal clients in the Washington, DC area. Richard has successfully implemented Agile principles in managing web projects, implementing data transactions services, creating an international general ledger application, and implementing enterprise level financial packages. As a management consultant, Richard has coached and mentored clients on the adoption and implementation of Agile and Scrum. Richard also leads Excella’s Agile Center of Excellence. Currently, Richard is working to bring Agile to Federal government and is managing an Agile iterative solution on an Office of Personnel Management (OPM) program. A graduate of Virginia Tech, Richard has authored several publications on project management, presented at Agile and PMI sponsored industry events, and is a member of Mensa. Richard is a certified Project Management Professional (PMP), a Certified Scrum Master (CSM), and a Certified Scrum Practitioner (CSP). Richard is an active member of the Project Management Institute (PMI), Agile Project Leadership Network (APLN), and Scrum Alliance. Andy Pickler, CSM, is an Agile Expert within Northrop Grumman, currently leading a longstanding program through an agile transition. Andy has served as a Scrum Master, Product Owner, and Release Manager for several agile teams and programs, both within the government and commercial space. Shannon Ewan is a Managing Consultant at Excella Consultant and a member of Excella’s Agile Center of Excellence. Shannon is a former member of the APLN DC leadership committee and is currently working to bring Agile to the Department of Defense. Shannon is a Project Management Professional (PMP) and a Certified Scrum Master (CSM). Good luck today. I hope it is productive. you need to be permanent used with steady monthly gain and need to possess degree e-mail address and negotiable vary. Some lenders don't mind endow this assist to the oldsters with poor credits. you will be auto title loans mobile able to be throughout an edge to amass instant text loans quite with ease simply by filling an easy on-line kind that is accessible at the lender’s machine.